My friend Julie dropped by with a bag of oat flour this week. Such a good friend! She and I share a love of oats, especially in chocolate chip oatmeal cookie form, and I promised I’d bake a treat for her using the oat flour. While musing over the oat flour (delightful moments indeed), I thought of Abby Dodge’s Bake Together Challenge. 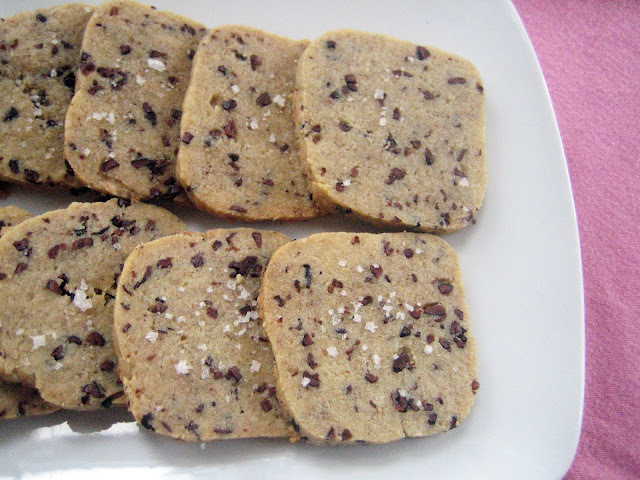 This month’s recipe is a savory sable. I am always fond of a buttery, flaky cracker and Abby shared her recipe to get started. With the oat and chocolate theme foremost on my mind, I decided to create a savory version for the sables. 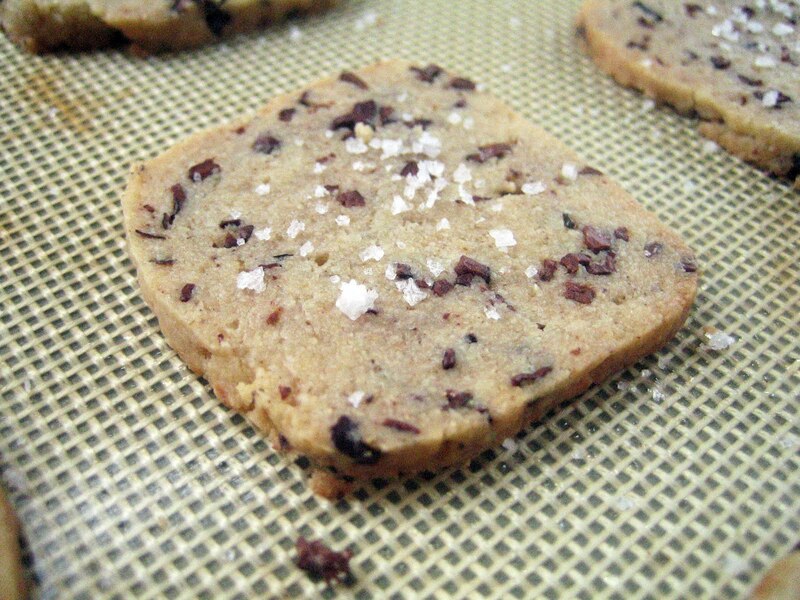 By swapping out some of the all-purpose flour for oat flour and including cacao nibs I could get the oat and chocolate flavors without the sweetness of a cookie. A little goat cheese added creamy indulgence, too. The dough for the sables came together perfectly and was easy to work with. The resulting sable is delicate and crispy, rather like an afternoon tea biscuit. They are quite dainty and pair well with a soft topping, such as clotted cream or cultured butter. Speaking of which, I am happy to report I had great success with making cultured butter and clotted cream this week! Small jars of each sit in my fridge now and make me very happy every time I open the door. I must admit, I’ve been in dairy heaven with all the tasting I’ve been doing. 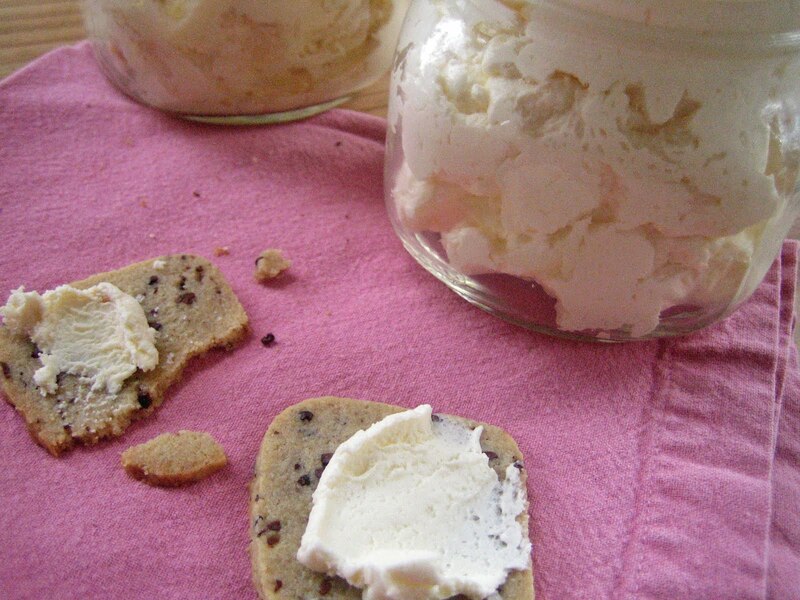 Clotted cream is a new family favorite, and I can’t wait to start dipping this spring’s fresh radishes in the butter. So much to look forward to! I followed Abby’s directions exactly, adding the cacao nibs after the cold water and pulsing a few times. You are so right, Barbara! This is a terrific dough to get creative with - definitely one to make again with new ideas. I like your jam topping - it sounds like the perfect bit of sweetness. Good eats, and it looks like it's not sweet at all with one tbsp of brown sugar... I love it! Thank you, Marina! I had to set proper tasting expectations with my boys and say that these are not sweet cookies - think crackers! 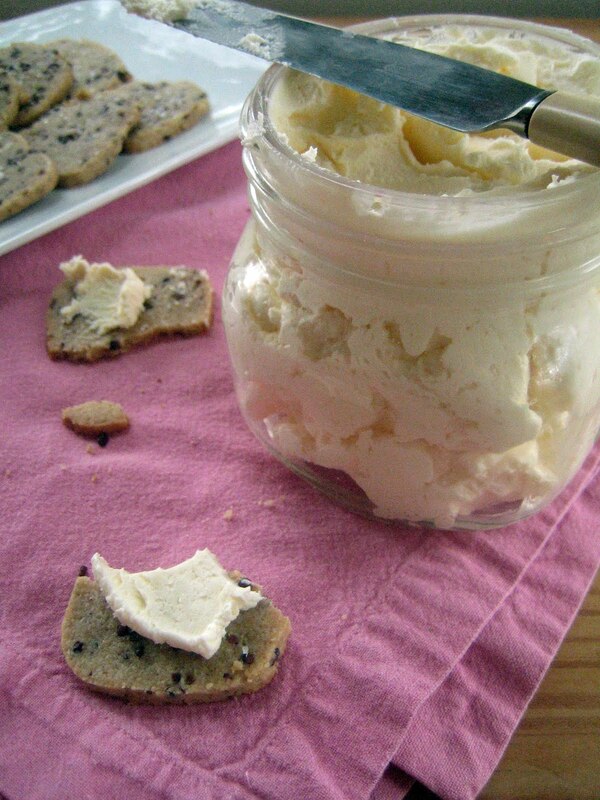 I'll definitely have to try making clotted cream--yum! I've been really curious about cacao nibs, and I have yet to try them. Your sables sound really good, especially with that smear of goat cheese! Thank you, Brianne - oh yes, I hope you can try both clotted cream and cacao nibs soon! Love this, I'm a fan of oats in whatever form they happen to take and adding the cacao nibs with goat cheese is lovely. These are so creative, what a wonderful sable this must be. Thank you, Suzanne! This is such a great recipe to tweak and have fun with, and I like the kneading technique that Abby shares. Cultured butter and clotted cream? WOW! I can't believe you made them yourself. Now about that oat flour. Where did she get it? What a fantastic use for it. I can only imagine how great that tastes! I know - I felt like such a domestic wizard making butter and clotted cream! The clotted cream couldn't have been easier and is so much cheaper (and tastier) than the outrageously priced imported jars I've seen. I highly recommend it and can't wait to slather it on a scone. The oat flour is Bob's Red Mill brand - I think places like PCC or Whole Foods carry it. Great for pancakes, too! I love these!! I've never used oat flour before but am totally intrigued. Thanks, Katherine! I've been exploring different flours (Kim Boyce's book Good to the Grain has been a big inspiration) and now my fridge is full of flours like rye, barley, oat, spelt...I'm learning about the different gluten levels and flavors of each and it's been fun (and tasty!). These look great, Hannah! I've not used oat flour before, but I'm sure I'd love it. What a great idea!! And love the inclusion of the cocoa nibs. They are my favorite new ingredient that I'm finding all kinds of uses for! Thank you, Susan! Aren't cocoa nibs marvelous? They work so well with savory or sweet and add a tremendous amount of flavor. I'm going to put them in granola the next time I make it. Have a good week! These look great, and would never have thought of topping with goat cheese but as soon as you mentioned it I wanted it! And clotted cream.....was it easy to make? I hope we see that sometime soon...I adore that stuff...,memories of childhood holidays in Cornwall and dollops & dollops of the stuff! Thanks, Mairi! The clotted cream couldn't have been easier. I'm not sure what other recipes are like but the one I used was terrific (the link is above if you want to give it a go). What wonderful memories you have of it! Hope your week is off to a good start! Hi Hannah! I love sables more than typical cookies. I need a good earl grey tea for these delicious sables! Thank you, Nami! I'm new to the world of sables and look forward to making them more. Earl grey would be perfect with a plate of them to enjoy!